We have been very, very busy. Yesterday morning EJ and I drove to the city to buy him new machinist tools. Machinists always have their own tools. I felt as if we were buy him supplies for the first day of school. These are all filled with books…and still there are more books. On the way home, we stopped at the grocery store to see if they had any more boxes, but they didn’t. We stopped at our little gas station store and they said they only have boxes on Tuesday. A few FB friends suggested asking a liquor store for boxes–their boxes tend to be very sturdy, they said. So I called the local store and was told they had lots. JJ and I made two trips and brought home 2-3 dozen boxes. We spent some time packing books. Mostly JJ brought armloads of books downstairs and I packed them. We worked all today and finally got all the books in the library packed. Now we have the books from JJ’s room, which fills three bookcases, as well as the books in the china cabinet downstairs. I think we are going to have to rent a moving van just for the books. 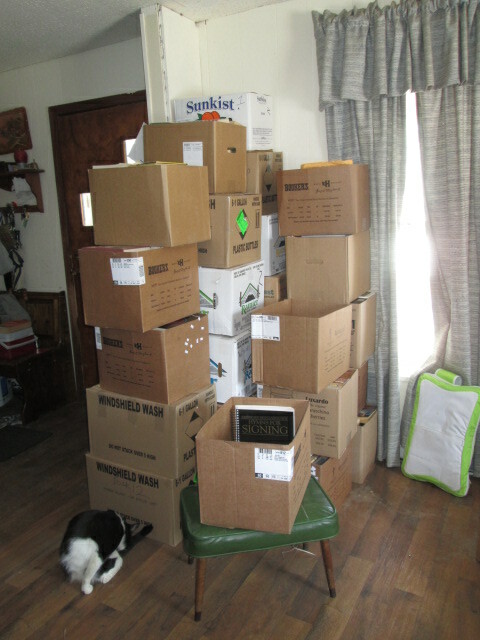 I have decided that a person can NEVER have too many books….UNLESS they are moving. While we packed, the cats went racing around the house, always seeming to know where they’d be most in the way. Earlier this afternoon a co-worker–well, now a former co-worker–stopped by and took away our TV. Last April the screen went dark and we just didn’t care about getting it fixed. The guy thinks it’s something minor so we gave it to him. Just one less than to have to try to move. Yesterday was EJ’s last day at the old job. He came home early–mostly because he wasn’t feeling well. He was going to try to finish more drywalling–maybe to the point where I could paint, but he is feeling really miserable. I hope he can get to feeling really soon because tomorrow he has to make the long drive to the new location and start the new job on Monday. It’s going to be tough enough starting a job without being sick. I’m rather concerned about him. Please keep him in your prayers. I will be so glad when EJ is settled in his new job and we are settled in the new location. The transition is not fun. Certainly will keep u in prayers. Hope it all goes well.